Senator Boats has an enviable reputation for building no-compromise vessels, so what better place to put an RH690 through its paces than the wild, west coast of Kawhia. Matthew Jones reports. Senator Boats was founded by pontoon pioneer and passionate outdoorsman Wayne McKinley. 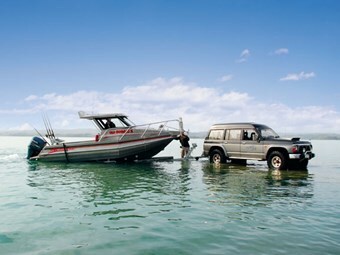 Napier born and bred, the Senator range has been designed and built to handle conditions that would send lesser vessels running for the safety of their trailers. The Hawke's Bay coast is exposed, and the fishing ground is a long way offshore, so a capable vessel is mandatory. "Pretty much everyone that's gone fishing out of Hawke's Bay has been caught out by the weather. So at Senator our philosophy is to build boats that will get you home safely. We've worked hard to strike a compromise between comfort and stability," says Senator factory manager Roger Young. Young says he never ceases to be amazed at what Senator customers' get up to in their boats. "While we certainly wouldn't recommend it, we've got three of our old 440's chasing big game 30 miles off the West Coast. That's the Kiwi way though; you buy something that's a certain size and built for a certain purpose and you always tend to use it for more than it was designed for. That's why we build our boats robust… just in case." The Senator range has undergone a revamp with the introduction of a new CAD manufacturing system. "During the changeover process we've taken the opportunity to upgrade all our models and introduce some of the changes our customers have asked for. The new RH690 is a bit longer and wider than its predecessor – the RH680 – and it's the smallest of our boats that features the maximum road-legal 2.5-metre beam," says Young. Each boat that leaves the factory is built to MSA Survey standards and can be put into survey with the required safety equipment and windscreen. Customisation is up to the customer. "We encourage our customers to come to us with their own ideas and to visit the factory to see how their boat is progressing. While they're here they often see features on other boats that they want to incorporate into their own build, which we're happy to do. That's the business we're in." 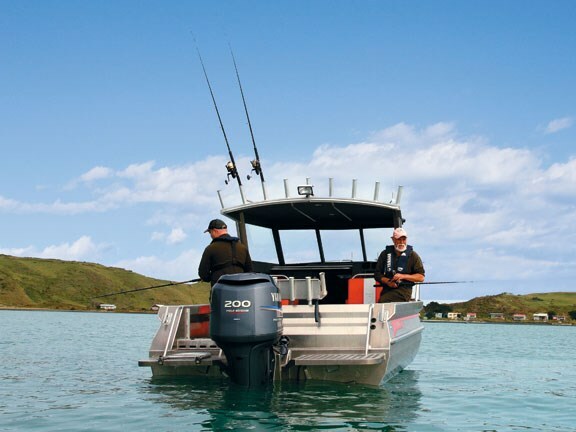 Owner Dave Asplin has lived in Kawhia for 10 years and having previously owned a couple of reputable aluminium boats, he opted to side with Senator this time 'round, purchasing the RH690. "It's a vast improvement on what I've previously had. It's magic in the rough and you don't have to worry because the boat basically looks after itself." Quizzed on the Senator's ride, Asplin is all smiles. "It's definitely not hard. And there's none of the rocking and rolling s**t, and certainly none of this twisting and turning s**t either. You'll be surprised mate". And to be honest I was too, but more on that later. Asplin bought the boat purely for fishing and says that's what the Senator was designed for and it does it well. 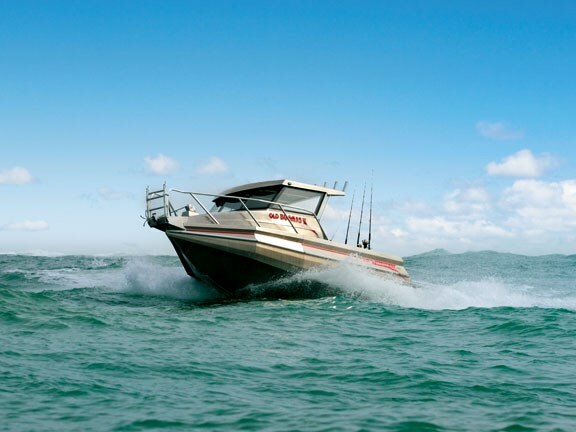 He uses his Senator for chasing King Tarakihi, Hapuku and Marlin over the Kawhia bar and loves the safety factor, the ride, the comfortable seats, the big duckboards and the lockable front cabin. Asked whether he'd change anything, Asplin says he wouldn't but that he wouldn't mind an even bigger model. Strength and safety was the deal clincher for Asplin: "I reckon it's a stronger boat than all the other ones I've seen. I really like the way Senator leaves the welds un-ground for extra strength." As a regular deep-water angler, Asplin's only gripe was that he had to fit an aftermarket mount for the automatic winch to alter the rode angle to stop it slipping under load. He found Senator Boats good to deal with and enjoyed one-on-one contact with his assigned boat builder through the build process. Any day you receive an offer of a fishing trip on a purpose-built boat out of Kawhia is a very good day indeed, but the trip was very nearly cancelled when Asplin rolled his quad bike on his farm a couple of days prior. Lucky they breed 'em tough in Kawhia, so after receiving the green light on a Friday afternoon, I packed my bags and eagerly headed to the wilds of the Kawhia coast. At dawn the following morning the Kawhia Bar could be heard rumbling from our accommodation half an hour away. This didn't bode well for heading out wide, so after rolling Old Buggas III out of the barn and giving her a quick spruce up for the photos, we loaded the scallop dredges as a Plan B. After a hassle-free, full-tide launch at the Kawhia ramp, the fold-down bow ladder helped provide a safe and easy (as long as the anchor is out of way) boarding option from the beach. Getting inside was trouble-free with the option of dropping down through the large front hatch, or skipping around the side of the hardtop. To maximise cockpit space the side deck around the cabin has been kept narrow and the high bow rails afford excellent security. Once aboard, the full size of the RH690 becomes apparent; an uncluttered, workable cockpit boasts plenty of protection from the elements. Asplin's personal touches include the big red seats, a 150mm hardtop extension, 100mm duckboard extensions (so he can sit his oversize scallop dredges on them), and a customised transom ladder that won't snag on the dredge nets. He's also had the wheels on the trailer upgraded to 14-inch rims because "they've got a fair bit sitting on them." Inside the cabin the full length bunks and large infill squab provide a comfortable resting place. Asplin didn't opt for a toilet but one could be fitted beneath. Storage options abound beneath the squabs and along the in-built cabin shelves. Access to the dash wiring is excellent too, through the large removable rear hatch. Moving rearward into the cockpit, there's excellent headroom beneath the hardtop. Storage is plentiful too, with a multitude of shelves and cubby holes with handy raised edges. Every fixture, fitting and handrail is rock solid and there's an abundance of secure hand-holds throughout. Like everything else on this boat the king/queen helm seats are big and exceptionally comfortable. Both seats include open easy access storage lockers with a large under seat compartment capable of taking a fish bin or multiple dive tanks. Once at the mouth of Kawhia Harbour the sight of a 1.5m breaking swell and a nor-west breeze confirmed our fears that heading out across the bar (which is another kilometre further out to sea) would be too uncomfortable; especially given Asplin's recent disagreement with his quad bike and Kawhia hospitality the night before. It did however present a good opportunity to put the Senator's rough water credentials to the test. While venturing into the breakers we dropped into a few big pot holes left by passing waves and my initial thoughts of impending pain quickly abated when the one tonne of aluminium boat came down very nicely indeed. The visibility, ergonomics and handling are to be commended and it didn't take long to feel safe and fully in control at the helm. Perhaps the biggest testament to the RH690's rough water-ride is the fact that Asplin made numerous runs through the breakers for the photo shoot with cracked ribs. Aside from superior stability, another key advantage that the big pontoons provide in these sorts of conditions is that even at almost 7m in length, the RH690 can be spun on a dime if you need to turn and run in a hurry. Asplin says the Yamaha 200hp four-stroke is "just magic" and provides smooth and audibly pleasing acceleration and responsiveness when required in the rough. Being such a sizeable and solid boat, she's not overly quick, but feels very comfortable at 4500rpm for 23 knots and 1.83-litres of petrol per nautical mile. 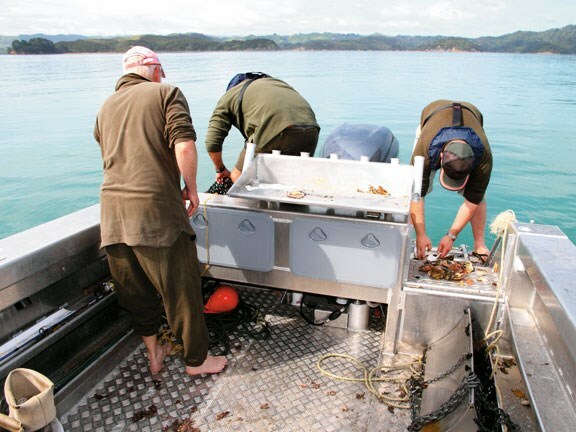 Safely back inside Kawhia Harbour, crewmates' Steve and Jason deployed two of Asplin's specially made Scallop harvesting devices and the functional cockpit was put to good use. The extended duckboards came into their own when lifting the large dredges on-board where they could be sifted and the bounty placed up on the large custom bait board for measuring. It didn't take long before our limit of Kawhia scallops was sitting pretty in the live bait tank in the walk-through transom. Dredging for Scallops is a messy undertaking, but thanks to the easy-clean tread plate floor and saltwater wash-down, it didn't take long to have her shipshape again. The twin automatic bilge pumps made sure shipped water was quickly returned overboard without having to remember to flick the switch. The large under-floor bin gobbled up both dredges with ease for the trip home. Asplin says he fishes four very comfortably and five at a pinch. There's also the option to fish an angler out of the front hatch if required. And there's certainly no shortage of rod storage, with six fully-welded rod holders positioned along the wide thigh-high gunnels. The rocket launcher above provides another nine rod holders, plus a spot light for twilight excursions. The bait board accommodates a further seven rods if required. Old Buggas III sits on a DMW Premier Series tandem-axle trailer with hydraulic brakes, which Asplin tows with his steroid-infused twin-turbo Nissan Safari. While its two-tonne-plus towing weight requires a capable tow vehicle, the Senator is well within the braked towing capability of most 4WD's. Asplin and his partner Pauline can launch and retrieve the boat on their own (as long as the ramp is good enough) and he says driving the boat on and off the trailer is "a piece of cake." However, when the Kawhia current is running and conditions aren't ideal, it can be a handful for two as you'd expect. 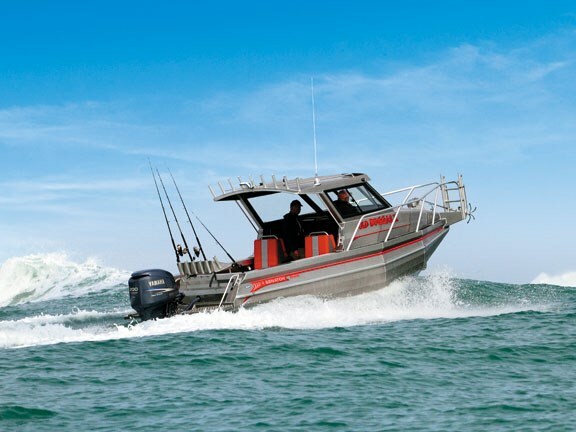 Senator's RH690 has all you need in a serious fishing boat: it's tough, safe, comfortable, functional and dependable, with rough water handling characteristics that inspire confidence. This makes it ideally suited to coastal adventures and bounty hunting. It's an excellent example of Senator's ability to seamlessly meld their customers' ideas into the build and, as such, none of Asplin's personal touches look or feel out of place. Special thanks to Rossy and Blue for their help with a photo boat. For more information contact Brett Gifford at Rollo's Marine ph 0800 804 809, email brett@rollosmarine.co.nz or visit rollosmarine.co.nz.